The FBCT App is a great way to stay connected, watch sermons, find information on ministries and events, submit prayer requests, and so much more! Download the APP today! 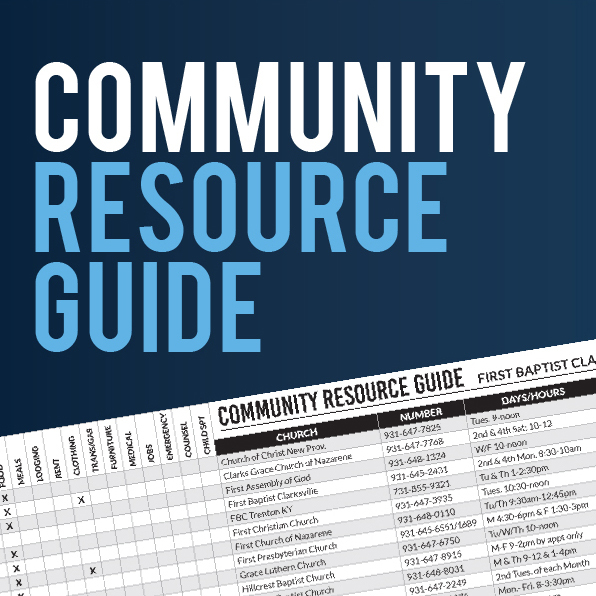 The Community Resource Guide includes a list of local churches and organizations that provide help through various ways. Click the link below to view the guide. RightNow Media at FBCT is an all-inclusive online resource that provides a full Bible Study Library, Customizable Training Library, and Leadership Events Library. This amazing interactive tool offers over 3,000 discipleship videos for kids, youth, college, and adults that can instantly be accessed for teaching resources, from experts across the country. Please email Beverly Ross to request an invitation and begin to explore the amazing online capabilities this resource can offer. The YouVersion Bible App is a great resource. You can create your own reading plan or follow along with sermon notes. You can download it to your phone! The mission of the FBCT Library is to advance Christian education and growth and promote beneficial media resources and services important to the ministry of First Baptist Clarksville, its staff, members, and guests. Sign up to receive our publications – from our weekly FBCT News and Notes to our monthly Voice – by email to stay up-to-date with events, news, and so much more!